Please DO NOT click any of the links or enter your credit card details. This type of email is not from us or the registry. In the body of the email it states.. It will also have your name and address and a link to pay. 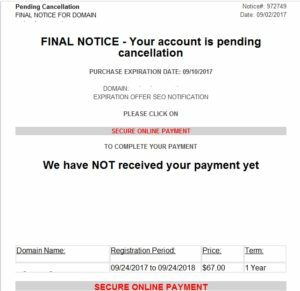 So this is an “offer” to sign up to a SEO search engine optimisation campaign – This is nothing to do with your domain registration. Your details will have been gleaned from the domain whois database. Once they have your card details they then sell on your details or just charge you and you get nothing. Domainsrush offer ID Protect for global domains such as .com, .net, .org. This will hide your contact details from the whois database. The “small print” at the foot of these phishing emails states. You have received this message because you elected to receive special notification offers. If you no longer wish to receive our notifications, please unsubscribe here or mail written request to SEO Optimization Services Inc., Miami, FL 33166. If you have multiple accounts with us, you must opt out for each one individually in order to stop receiving SEO notices. We are a search engine optimization company. 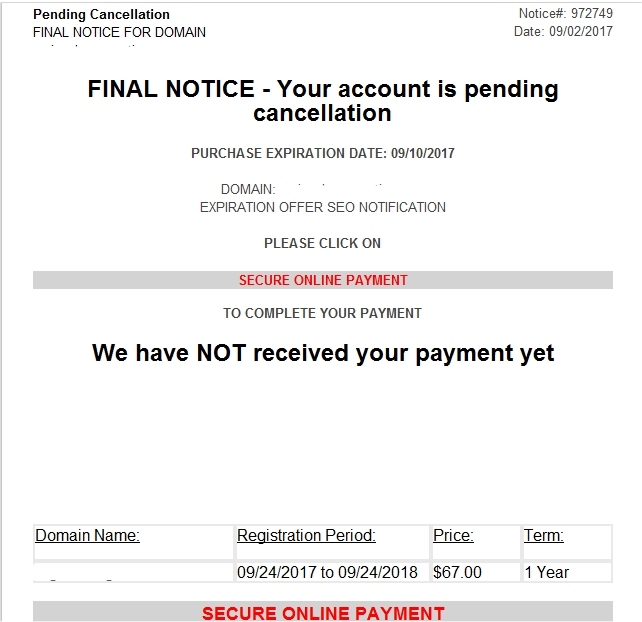 We do not register or renew domain names. We sell traffic generator software. This message is CAN-SPAM compliant. THIS IS NOT A BILL OR AN INVOICE. THIS IS A SEO PURCHASE OFFER. YOU ARE UNDER NO OBLIGATION TO PAY THE AMOUNT STATED UNLESS YOU ACCEPT THIS PURCHASE OFFER. This message contains promotional material strictly along the guidelines of the CAN-SPAM act of 2003. We have distinctly mentioned the source mail-id of this email and also disclosed our subject lines. They are in no way misleading. Please do not reply to this email, as we are not able to respond to messages sent to this address. If you are in doubt about any emails you receive regarding your domain registration, please contact us.